I’m going to put this as simple as I can: A brand is consistant message of who you are. It’s your business’ identity, and should be the same over all of the branding you do, whether it’s Facebook, Twitter, Google+, you website, or even your business card. This identity is not just about a logo though, it’s about something that people can relate to, associate with; something which will resonate to customers, to keep them coming back time after time. How Important is a Brand? If you want to grow, you need to be something that someone can get behind, and for that, you need to have a company image; a brand. Every company has a brand in one way or another, some are just more successful than others, and when it comes to successful brands, I can’t think of much better than presidential campaigns. In a very short space of time, they build an brand for themselves, covering everything I detail in the following section. 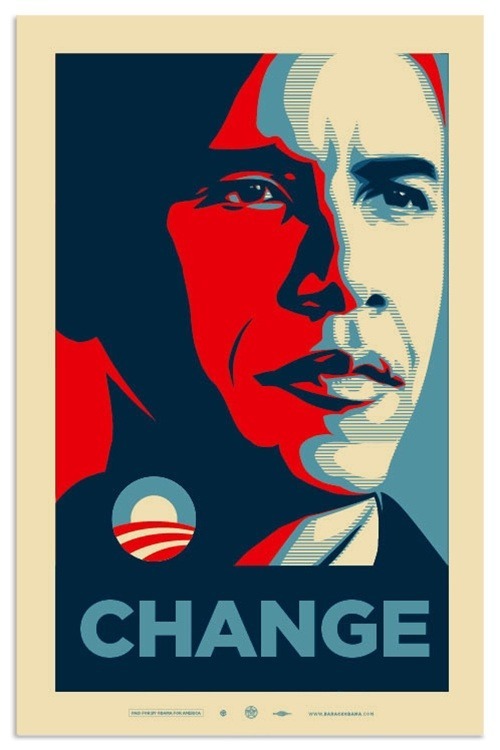 Think of Obama’s electoral campaign, how many of you have seen a variation of this poster before? I was reading a rather interesting article online today about Occupy Wall Street, and it was talking about their failure to come together as a simple brand. While we’re quite sure that corporate-world concepts like branding, marketing and messaging are the last things you’re thinking about at the moment, we’d strongly suggest you start soon if you want your movement to hold together and succeed. Here’s why: Today we live in a world where activism—no matter how organic—lives at an intersection with branding. And the simpler the message, the more likely it is to find a sympathetic following. …Movements with clear, simple messages are the ones that maintain focus and achieve the ends they originally sought, just like well-disciplined brands do. Think about Nike, Harley-Davidson or Apple. So yes, I would have to agree that Branding is exceptionally important when it comes to building a company, but why have so many businesses, particularly blogs and websites, got it wrong? The simple answer, as far as I can see, is that blogs are made by the likes of you and me, with no background in marketing, so we don’t know what we’re doing when it comes to building a brand (at least we think we don’t), but that’s about to change. A brand isn’t something you can throw together all at once if you’re just finding your feet in your field. You need to be able to first find your direction, and then test different changes that you make to your brand as you grow. Sure, if you’ve got a branding expert doing this for you, it will happen a lot quicker than that, but if you’re doing this on your own, then it’s going to take time. And that’s fine, because as you make adjustments, you can ask for feedback, and see how well received it is. The first thing that you need to focus on, is clearly stating what you do, not who you are. Hi, I’m Josh, I’m no one. My first blog was attached to my portfolio at www.JoshuaDunlop.com and guess what? It got next to no views. No one cares who Joshua Dunlop is, but they care what Expert Photography is. Just using the name you’re halfway to understanding what I’m about, and you’re even further than halfway when it comes to IncomeDiary. So choose the right name in the first place, because even though there are successful people, such as Arianna Huffington, who have built a brand around their name, that is by no means easy to do, and I wouldn’t recommend it to anyone starting out. Think about your keywords and what describes you best. Then think about what people are going to Google. As I mentioned in my last post on Facebook promotion tips that you don’t know about, it’s all well and good calling yourself Joshua Dunlop Imagery, but is that going to show up in Google, and will people know what you do when they do find you? Your name HAS to reflect your product. A visually attractive website is the next step to building a strong brand, that means putting a little bit of money into it, perhaps on a decent WordPress theme, and then changing it to suit your tastes and niche. I often flick through the websites of people who comment on IncomeDiary, and it seems to me that a lot of people don’t really pay too much attention to the design. I’ve spent very little money on ExpertPhotography, just the theme, a featured slider, a header, and a logo. It doesn’t take much, and we didn’t even do it all at once, but I consider all of it to be essential to building our brand. Your website needs to be welcoming, so think about how it feels to be on there. Does it load slowly? Is there too many ads? Are they too intrusive? Are the colour schemes hard to look at? Are there images where there’s supposed to be images? When you get to the bottom of a page, do you want to click on another? Is the theme customised enough so that it stands out from all other people using the same one? These are all questions you need to ask yourself when viewing your website, because building a brand is part of making people want to come to your website, and design is a big aspect of this. As my website has grown, my aim has always to be able to be recognised by a single image, because I’ve always felt that the strongest brands in the world are made like this. Think of Nike, think of Apple, think of Coca-Cola. Whether the symbol is an image, like the first two, or a manifestation of some text, into a widely recognised symbol. Coca-Cola hasn’t changed their logo since they started business and even though they’ve chosen a text based logo, you could write anything in that style, and you would still think Coca-Cola. To help build my own brand, I’ve gone with a simple text logo, accompanied by a circular spectrum of colour, which represents the aperture of the lens, which is suitable for my niche. I am slowly implementing the image into different parts of my website, starting at the header, and then as a watermark, and then Facebook, and soon, Twitter too. The Facebook integration of my branding is especially important because it allows me to carry out my brand through my marketing. Not only do I use my logo in my imagery, such as profile picture and wall photos, but I also use the symbol on it’s own, in the profile picture and as my thumbnail image. This is spread throughout my Facebook page, and then again on the website, in the two Facebook plugins, which only goes to reinforce my brand. As you can probably tell, repetition is very important to helping commit a brand to somebody’s memory, so it’s important to keep the brand repetition throughout what you do. We teach expert knowledge and techniques to photographers, from beginners through to advanced. That’s not really much of a slogan though really, it’s more of mission statement. 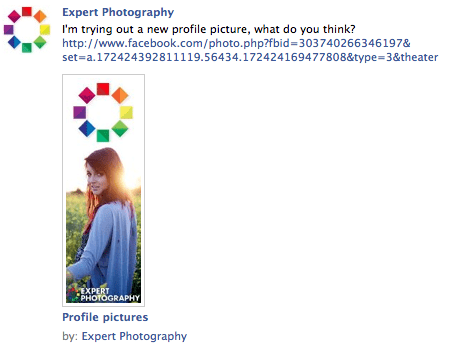 Something like ‘Great Photography made easy’ would be better, but that’s just off the top of my head. Lets have a look at some famous brand slogans, and see how many you recognise. The five companies above are Nike, Nokia, Google, LG and McDonalds, not that you really needed telling that. They are all very easily recognised by their slogans, which is no small feat. You see, they’ve stripped back all of their brand to just a few words, which we all recognise, whether they’re said in or out of context. One thing you may notice about the above five slogans/taglines is that only one of them, “Connecting People”, could you guess what they might do, and even then, you could be wrong. What does this tell us? Well, quite obviously, it’s more about the association with the rest of the branding which helps you to remember the slogan. Sure it needs to be vaguely related, but you really have a license with creative freedom. Some might even say that the contrast between the logo and title, and tagline is what makes you remember the slogan. You need to produce content that reflects your brand, whether you’re teaching, selling or just rambling. My brand is founded on photography tutorials, but I can, and will, expand into other areas of photography. My brand is photography, so to expand from there onto something that’s not nearly as relevant, such as art, would be a mistake. Stick to content that will build on your brand, because as it continues to grow, and as you gain a following, you will start to exclude the very people you’ve been working on getting to your website or business. This is something I’ve noticed recently as I’ve started to diversify my content a little bit more as I begin to run out of subject to write tutorials on, which will happen to the best of us. In the past week, I’ve written about how to find models for free, and how to build a Facebook fan page for a photographer. Both relevant content, but not the sort of standard of tutorial that some of my fans have come to expect. Both post have done reasonably well on Facebook, and I’m sure they will do well in Google too, but they’re not as popular as some of my old favourites. Lastly, and perhaps more important than any other thing on the list here is personality. Personality is what makes you stand out from the crowd. Some of my most popular articles have come from when I’ve written about something, using just my personal opinion as a source, because people are more interested in a person, than they are a business. Give your company a face, and you will soon start to become a lot more successful; I’ve been putting it to the test recently, and the difference is starting to show. Check out my post on why you’re not yet an authority on your niche to see what I mean. Think about bloggers who are famous purely because they write a blog. The likes of Perez Hilton spring to mind, as a man who has created a celebrity gossip blog, for the most part under his own name. There’s no denying that he is a strong character and personality, which has made him easy to remember, and kept fans coming back. Put a face to your blog. 10 eCommerce Trends Every Blogger Needs To Know About! 17 Writing Tips For Bloggers Who Think They Can’t Write! 11 Ways to Fake Your Way To Guru Status! I like to read most of your material because it is well thought out and put in simple, straightforward terms that most people can understand. This article is superb. Right on. Keep up the good work. Thanks Bob, happy to help! I think people get lost in brand building some time. Yes, brand is very important but when you start bending your content out of shape just to build your brand, you’re in trouble. The best brands are the ones that grow naturally, out of the content, products and services you generate. Look at Apple for example, their brand started working for them only after they started putting out products that people cared about. At that point it became self reinforcing as their brand and products were a perfect match for one another. Hi, great article, very timely as I have my logo competition running on 99Designs at this very moment. I’m really pleased with the one I think is the winner. BTW, check out http://www.news.com.au as they use the colored cycle motif you also use. Yeah that’s a really good way to get one made. I spent most of my time designing my logo and theme for my my brand new business. I must mention how its crucial to consider choosing at least three colours to define your brand! its very essential. Thanks Josh. Well thought out… The struggles with brand seems to be the smaller the business the less they understand how important ‘brand’ is… When its more important to the smaller business.. Nice read, like most of your articles..
We agree branding is very important. Great article! Wow ,those pictures are really fantastic! (ExpertPhotography)Just can’t stop browsing it..
Best Regards to All . Thanks for showing your idea. I like to read most of your things since it is sound idea exposed and put in easy, simple conditions that the majority public can recognize. you have to plan best brand strategy including slogan, logo, and content. Branding really comes down to consistency, authenticity and familiarity. If you grade all things you write, say, post and creat you’ll attain instantly recognizable AND trusted status sooner than you think. Great post and breakdown, Josh!